May Morning is celebrated on 1 May every year. May Morning in Oxford is a traditional celebration of the coming of Spring and brings together Oxford's communities to enjoy dancing, singing and revelry from around the city. Visit the May Morning Oxford website for more information about the event's history. The celebrations in 2019 will start at 6am on Wednesday 1 May 2019 with the choristers of Magdalen College choir singing Hymnus Eucharisticus from the Great Tower. Hymnus Eucharisticus was composed in the 17th century by a Fellow of Magdalen and has been sung every year from the Great Tower on May Morning. The choir begin singing at 6am and we recommend you arrive anytime after 5am to find a spot on the bridge. At approximately 6.10am the choir will finish singing and bell ringing will begin. Bell ringing will finish at approximately 6.30am to signal the end of the event. Many people visit local restaurants and cafés following the event to indulge in a May Morning breakfast. Please be aware there may be live filming and streaming of the event at Magdalen Bridge. Visit our Crowd Management page for full details. 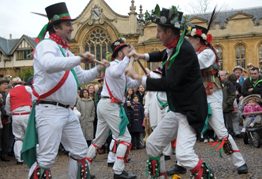 May Morning events and activities will take place across the city including Morris Men dancing in Radcliffe Square, Catte Street and Broad Street.